The communication procedure is outlined in articles 1 to 7 of the Optional Protocol to the Convention on the Elimination of All Forms of Discrimination against Women (Optional Protocol). The procedure confers authority on the Committee on the Elimination of Discrimination against Women to consider communications (i.e., petitions or complaints) submitted by or on behalf of individuals or groups of individuals, claiming that a State Party has violated their rights in the Convention on the Elimination of All Forms of Discrimination against Women (CEDAW). The communication procedure consists of a number of distinct stages. The communication procedure is triggered when a communication is submitted to the CEDAW Committee for its consideration. A communication must be in writing, cannot be anonymous, and must concern a State Party to the Optional Protocol, in order for it to be ‘received’ by the Committee (Optional Protocol, art. 3). A request for interim measures to prevent possible irreparable damage to the victim(s) can be made at any time after a communication is registered and before the Committee reaches a final determination on the merits. 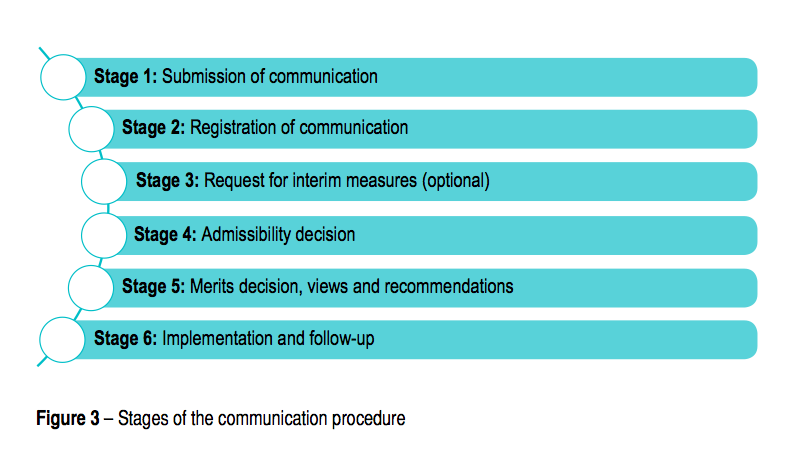 Once a communication is registered, the Committee must decide by a simple majority whether it is admissible, as outlined in articles 2 and 4 of the Optional Protocol. Communications may be submitted by or on behalf of individuals or groups of individuals, under the jurisdiction of a State Party, claiming to be victims of a violation of any of the rights set forth in the Convention by that State Party. Where a communication is submitted on behalf of individuals or groups of individuals, this shall be with their consent unless the author can justify acting on their behalf without such consent. (1) The Committee shall not consider a communication unless it has ascertained that all available domestic remedies have been exhausted unless the application of such remedies is unreasonably prolonged or unlikely to bring effective relief. (e) The facts that are the subject of the communication occurred prior to the entry into force of the present Protocol for the State Party concerned unless those facts continued after that date. If the Committee decides that a communication is admissible, it examines the merits of the allegations. This requires the Committee to decide whether the State Party has met its legal obligations under CEDAW. The Committee publishes ‘views’ in which it identifies whether the State Party violated rights in CEDAW. In communications where a violation of CEDAW is found, the Committee makes recommendations on how the State Party should redress those violations. Although views are not legally binding, a State Party must give due consideration to the findings and recommendations of the Committee. It must provide a formal, written response to the Committee within six months, which includes information about steps it has taken to address the Committee’s views and implement its recommendations. The Committee may also follow-up on the State Party’s progress in this regard.